Open-source hardware (OSH), consists of physical artifacts of technology designed and offered by the open design movement. Both free and open-source software (FOSS) as well as open-source hardware is created by this open-source culture movement and applies a like concept to a variety of components. It is sometimes, thus, referred to as FOSH (free and open-source hardware). The term usually means that information about the hardware is easily discerned so that others can make it - coupling it closely to the maker movement. Hardware design (i.e. mechanical drawings, schematics, bills of material, PCB layout data, HDL source code and integrated circuit layout data), in addition to the software that drives the hardware, are all released under free/libre terms. The original sharer gains feedback and potentially improvements on the design from the FOSH community. There is now significant evidence that such sharing can drive a high return on investment for investors. Since the rise of reconfigurable programmable logic devices, sharing of logic designs has been a form of open-source hardware. Instead of the schematics, hardware description language (HDL) code is shared. HDL descriptions are commonly used to set up system-on-a-chip systems either in field-programmable gate arrays (FPGA) or directly in application-specific integrated circuit (ASIC) designs. HDL modules, when distributed, are called semiconductor intellectual property cores, or IP cores. One example of open-source hardware is Phonebloks. First hardware focused "open source" activities were started around 1997 by Bruce Perens, creator of the Open Source Definition, co-founder of the Open Source Initiative, and a ham radio operator. He launched the Open Hardware Certification Program, which had the goal to allow hardware manufacturers to self-certify their products as open. Shortly after the launch of the Open Hardware Certification Program, David Freeman announced the Open Hardware Specification Project (OHSpec), another attempt at licensing hardware components whose interfaces are available publicly and of creating an entirely new computing platform as an alternative to proprietary computing systems. In early 1999, Sepehr Kiani, Ryan Vallance and Samir Nayfeh joined efforts to apply the open source philosophy to machine design applications. Together they established the Open Design Foundation (ODF) as a non-profit corporation, and set out to develop an Open Design Definition. But, most of these activities faded out after some years. By the mid 2000s open source hardware again became a hub of activity due to the emergence of several major open source hardware projects and companies, such as OpenCores, RepRap (3D printing), Adafruit and SparkFun. 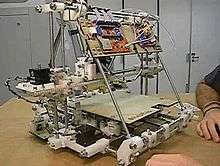 In 2007, Perens reactivated the openhardware.org website. Following the Open Graphics Project, an effort to design, implement, and manufacture a free and open 3D graphics chip set and reference graphics card, Timothy Miller suggested the creation of an organization to safeguard the interests of the Open Graphics Project community. Thus, Patrick McNamara founded the Open Hardware Foundation (OHF) in 2007. The Tucson Amateur Packet Radio Corporation (TAPR), founded in 1982 as a non-profit organization of amateur radio operators with the goals of supporting R&D efforts in the area of amateur digital communications, created in 2007 the first open hardware license, the TAPR Open Hardware License. The OSI president Eric S. Raymond expressed some concerns about certain aspects of the OHL and decided to not review the license. Around 2010 in context of the Freedom Defined project, the Open Hardware Definition was created as collaborative work of many and is accepted as of 2016 by dozens of organizations and companies. In July 2011, CERN (European Organization for Nuclear Research) released an open source hardware license, CERN OHL. Javier Serrano, an engineer at CERN’s Beams Department and the founder of the Open Hardware Repository, explained: “By sharing designs openly, CERN expects to improve the quality of designs through peer review and to guarantee their users – including commercial companies – the freedom to study, modify and manufacture them, leading to better hardware and less duplication of efforts”. While initially drafted to address CERN-specific concerns, such as tracing the impact of the organization’s research, in its current form it can be used by anyone developing open source hardware. Following the 2011 Open Hardware Summit, and after heated debates on licenses and what constitutes open source hardware, Bruce Perens abandoned the OSHW Definition and the concerted efforts of those involved with it. Openhardware.org, led by Bruce Perens, promotes and identifies practices that meet all the combined requirements of the Open Source Hardware Definition, the Open Source Definition, and the Four Freedoms of the Free Software Foundation Since 2014 openhardware.org is not online anymore and seems to have ceased activity. The Open Source Hardware Association (OSHWA) at oshwa.org proposes Open source hardware and acts as hub of open source hardware activity of all genres, while cooperating with other entities such as TAPR, CERN, and OSI. The OSHWA was established as an organization in June 2012 in Delaware and filed for tax exemption status in July 2013. After same debates about trademark interferences with the OSI, in 2012 the OSHWA and the OSI signed a co-existence agreement. In 2012, after years of skepticism on the relevance of free hardware designs, the Free Software Foundation started the "Respects Your Freedom" (RYF) computer hardware product certification program. It should encourage the creation and sale of hardware that respects users' freedom and privacy, and aims to ensure that users have control over their devices. The FSF's RYF certificate faced criticism for the requirement to comply with the controversial debated FSF terminology, which is seen by some as unrelated topic and unneeded political polarization for a technological certificate. Also FSF's Replicant project suggested in 2016 an alternative "free hardware" definition, derived from the FSF's four freedoms. Rather than creating a new license, some open-source hardware projects simply use existing, free and open-source software licenses. These licenses may not accord well with patent law. Later, several new licenses have been proposed, designed to address issues specific to hardware designs. In these licenses, many of the fundamental principles expressed in open-source software (OSS) licenses have been "ported" to their counterpart hardware projects. New hardware licenses are often explained as the "hardware equivalent" of a well-known OSS license, such as the GPL, LGPL, or BSD license. "... those who benefit from an OHL design may not bring lawsuits claiming that design infringes their patents or other intellectual property." In March 2011 CERN released the CERN Open Hardware License (OHL) intended for use with the Open Hardware Repository and other projects. The Solderpad License is a version of the Apache License version 2.0, amended by lawyer Andrew Katz to render it more appropriate for hardware use. The Open Source Hardware Association recommends seven licenses which follow their open-source hardware definition. From the general copyleft licenses the GNU General Public License (GPL) and Creative Commons Attribution-ShareAlike license, from the HW specific copyleft licenses the CERN Open Hardware License (OHL) and TAPR Open Hardware License (OHL) and from the permissive licenses the FreeBSD license, the MIT license, and the Creative Commons Attribution license. Openhardware.org recommended in 2012 the TAPR Open Hardware License, Creative Commons BY-SA 3.0 and GPL 3.0 license. Organizations tend to rally around a shared license. For example, Opencores prefers the LGPL or a Modified BSD License, FreeCores insists on the GPL, Open Hardware Foundation promotes "copyleft" or other permissive licenses", the Open Graphics Project uses a variety of licenses, including the MIT license, GPL, and a proprietary license, and the Balloon Project wrote their own license. Extensive discussion has taken place on ways to make open-source hardware as accessible as open-source software. Discussions focus on multiple areas, such as the level at which open-source hardware is defined, ways to collaborate in hardware development, as well as a model for sustainable development by making open-source appropriate technology. In addition there has been considerable work to produce open-source hardware for scientific hardware using a combination of open-source electronics and 3-D printing. One of the major differences between developing open-source software and developing open-source hardware is that hardware results in tangible outputs, which cost money to prototype and manufacture. As a result, the phrase "free as in speech, not as in beer", more formally known as Gratis versus Libre, distinguishes between the idea of zero cost and the freedom to use and modify information. While open-source hardware faces challenges in minimizing cost and reducing financial risks for individual project developers, some community members have proposed models to address these needs. Given this, there are initiatives to develop sustainable community funding mechanisms, such as the Open Source Hardware Central Bank. Often vendors of chips and other electronic components will sponsor contests with the provision that the participants and winners must share their designs. Circuit Cellar magazine organizes some of these contests. One of the most popular types of open-source hardware is electronics. There are numerous companies that provide large varieties of open-source electronics such as Sparkfun and Adafruit. In addition, there are NPOs and companies that provide a specific electronic component such as the Arduino electronics prototyping platform. There are numerous examples of speciality open-source electronics such as low-cost voltage and current GMAW open-source 3-D printer monitor and a robotics-assisted mass spectrometry assay platform. Open hardware companies are experimenting with different business models. In one example, littleBits implements open-source business models by making the design files available for the circuit designs in each littleBits module, in accordance with the CERN Open Hardware License Version 1.2. In another example, Arduino has registered its name as a trademark. Others may manufacture their designs, regardless of Arduino denying the correct schematics and the Bill of Materials, but can't put the Arduino name on them. Thus they can distinguish their products from others by appellation. There are many applicable business models for implementing some open-source hardware even in traditional firms. For example, to accelerate development and technical innovation the photovoltaic industry has experimented with partnerships, franchises, secondary supplier and completely open-source models. Recently, many open source hardware projects were funded via crowdfunding on Indiegogo or Kickstarter. Cover for "Open-Source Lab" by Joshua M. Pearce (2014). Richard Stallman, the founder of the Free Software movement, was in 1999 skeptical on the idea and relevance of Free hardware (his terminology what is now known as open-source hardware). In a 2015 Wired article he adapted his point of view slightly; while he still sees no ethical parallel between free software and free hardware, he acknowledges the importance. Also, Stallman uses and suggest the term free hardware design over open source hardware, a request which is consistent with his earlier rejection of the term open source software (see also Alternative terms for free software). Other authors, such as Joshua Pearce have argued there is an ethical imperative for open-source hardware – specifically with respect open-source appropriate technology for sustainable development. 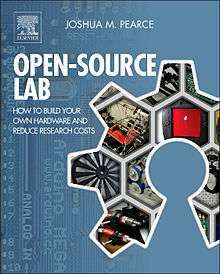 In 2014, he also wrote the book Open-Source Lab: How to Build Your Own Hardware and Reduce Research Costs, which details the development of free and open-source hardware primarily for scientists and university faculty. ↑ Alicia Gibb (Ed.) Building Open Source Hardware: DIY Manufacturing for Hackers and Makers, Addison-Wesley: New York, pp. 253-277 (2015). ↑ "Free Hardware and Free Hardware Designs". Free Software Foundation Inc.
↑ Perens, B. 1997. Annoucing: The Open Hardware Certification Program. Debian Announce List. .
↑ McNamara, P. 2007a. “Open Hardware.” The Open Source Business Resource (September 2007: Defining Open Source). ↑ Ars Technica: TAPR introduces open-source hardware license, OSI skeptical. ↑ Freedom Defined. 2011. Open Source Hardware Definition. Freedom Defined. ↑ Bruce Perens, 2011a. Promoting Open Hardware. http://lists.openhardwaresummit.org/pipermail/updates-openhardwaresummit.org/2011-September/000565.html. ↑ Bruce Perens. 2011b. Open Hardware – Constitution. Open Hardware. http://wiki.openhardware.org/Project:Constitution. ↑ "Respects Your Freedom hardware product certification". fsf.org. ↑ Replicant - Freedom and privacy/security issues [online]. (2016). Available from: <http://www.replicant.us/freedom-privacy-security-issues.php>. (Accessed 02/22/2016) "The freedom to use the hardware, for any purpose. The freedom to study how the hardware works, and change it so it works as you wish. Access to the hardware design source is a precondition for this. The freedom to redistribute copies of the hardware and its design so you can help your neighbor. The freedom to distribute copies of your modified versions to others. By doing this you can give the whole community a chance to benefit from your changes. Access to the hardware design source is a precondition for this". ↑ From OpenCollector's "License Zone": GPL used by Free Model Foundry and OpenSPARC; other licenses are used by Free-IP Project, LART (the software is released under the terms of the GNU General Public License (GPL), and the Hardware design is released under the MIT License), GNUBook (defunct). ↑ Thompson, C. (2011). Build it. Share it. Profit. Can open source hardware work?. Work, 10, 08. ↑ For a nearly comprehensive list of licenses, see OpenCollector's "license zone"
↑ "The TAPR Open Hardware License". Retrieved 16 April 2015. ↑ "CERN Open Hardware Licence". Open Hardware Repository. CERN. 2012-07-05. Retrieved 2012-08-15. ↑ "Open Hardware Repository". Retrieved 16 April 2015. ↑ "Solderpad licenses". Solderpad.org. Retrieved 2012-08-15. ↑ FAQ on oshwa.org "What license should I use? In general, there are two broad classes of open-source licenses: copyleft and permissive. Copyleft licenses (also referred to as “share-alike” or “viral”) are those which require derivative works to be released under the same license as the original; common copyleft licenses include the GNU General Public License (GPL) and the Creative Commons Attribution-ShareAlike license. Other copyleft licenses have been specifically designed for hardware; they include the CERN Open Hardware License (OHL) and the TAPR Open Hardware License (OHL). Permissive licenses are those which allow for proprietary (closed) derivatives; they include the FreeBSD license, the MIT license, and the Creative Commons Attribution license. Licenses that prevent commercial use are not compatible with open-source; see this question for more." ↑ Open Source Hardware Central Bank, from "Make: Online : The Open Source Hardware Bank, retrieved 26 April 2010. ↑ Joshua Pearce. "Pearce Research Group - Current Projects". Retrieved 16 April 2015. ↑ Chiu, S. H. and Urban, P. L., 2015. Robotics-assisted mass spectrometry assay platform enabled by open-source electronics. Biosensors and Bioelectronics, 64, p. 260–268. ↑ Saddlemire, Katie (14 April 2015). "What does "Open Source" mean?". littleBits. littleBits. Retrieved 26 May 2015. ↑ "Build It. Share It. Profit. Can Open Source Hardware Work?". WIRED. Retrieved 16 April 2015. 1 2 Richard Stallman (2015-03-11). "Why We Need Free Digital Hardware Designs". Wired. Retrieved 2016-01-14. ↑ Joshua M. Pearce, "The Case for Open Source Appropriate Technology", Environment, Development and Sustainability, 14, p. 425–431 (2012). Wikimedia Commons has media related to Open hardware.